1974, Starring Roberts Blossom, Cosette Lee, Leslie Carson, Robert Warner, Marcia Diamond, Brian Smeagle. Directed by Alan Ormsby and Jeff Gillen. Ed Gein's 1957 murderous rampage has been the subject of many films, including The Texas Chainsaw Massacre, Psycho and to a much lesser extent, Silence of the Lambs. This is the Canadian version of Gein's life and his real-life exploits which include murder, grave robbing, cannibalism and necrophilia. Deranged is a fantastic cult film, which unlike the other versions of Gein's life, offers a kind of semi-humorous fictionalization of actual events. There is so much speculation about Gein's "idiosyncrasies" that the truth is anybody's guess. According to a 1981 documentary which follows the film on some versions of the home video, most of this film is true. However, I don't discount the influence of both Psycho and Texas Chainsaw Massacre in this particular recreation, as the movie obviously draws from some of the fictional events from those films as well. The directors have "changed the names to protect the innocent," so Ed's name is now Ezra Cobb (But Ed wasn't innocent, I hear you protesting). We also have a narrator, who occasionally steps in the frame to elaborate on the events. The movie begins with a short deathbed segment which aims to show the influence of Ezra's mother. During this scene she drops pearls of wisdom on Ezra like "The wages of sin is gonorrhea, syphilis and death!" and "All women are full of disease!". She is the ultimate domineering mother, but quickly dies. The narrator instructs us to jump forward a few years, and we see that Ezra has "recreated" his mother on her bed with a dress, shoes, and a photograph. He has also taken to berating himself in his mother's voice, just like Norman in Psycho. Ezra is working odd-jobs for his neighbour and friend, Harlon Kootz, and his once well-kept farmhouse is now littered with newspapers and men's magazines. Finally, he decides to "bring mother home," and digs her up. Unfortunately, he has imagined her looking exactly as she had in life, and is shocked when her body parts break off and begin to crumble away. The narrator steps back in to tell us of Ezra's quest for a method to repair his mother's body, from taxidermy to embalming. While having dinner with the Kootz family one night, Ezra learns that his Sunday school teacher has died. Harlon explains the concept of the obituary section to Ezra, who at first doesn't understand how it works. This is often the case, as Roberts Blossoms' portrayal of Ezra is as an honest, unassuming backwoods cracker. Ezra eventually decides to use the obituary section to find the freshly deceased so he can repair his mother's body with their "spare parts." He announces his plan at the dinner table, and the family laughs, assuming he is joking. Nobody's laughing in the next 'newly restored' scene, as Ezra (with the help of FX man Tom Savini) spoons the eyeballs out of his teacher's head. Then he hacksaws off her scalp and spoons out the brains. He puts the skin of her face over his mother's own face, and creates a kind of mask for her, which seems to work. 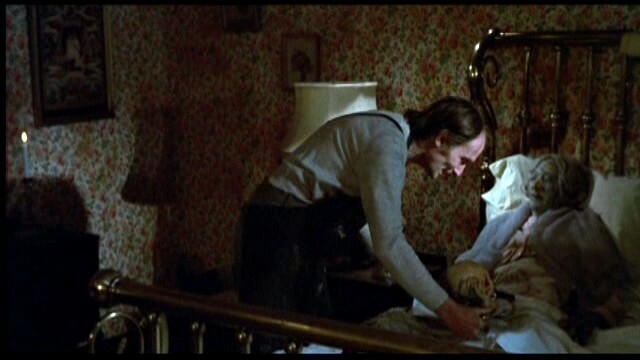 Then he places the remaining skull on the bedpost to keep his mother company. The Kootz family convinces Ezra that he needs to start dating, so he goes out with a friend of his mother, a large woman named Maureen. Maureen is a widow who believes she can talk with her dead husband, so right off the bat they have something in common! 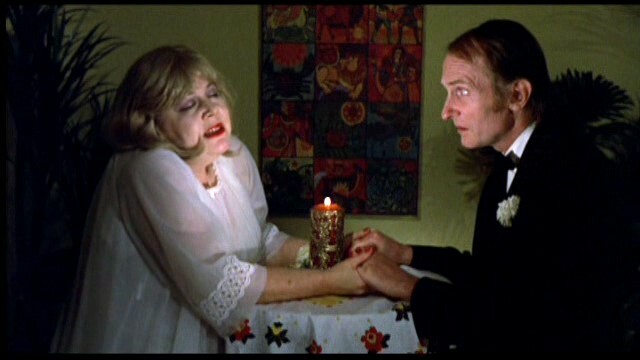 During a séance, Maureen's husband apparently enters her body (although it is probably just Maureen) and tells Ezra to favour Maureen with the "carnal aspects of marriage," but Ezra replies "Carnival?" After Ezra enters the bedroom he begins having flashbacks to his mother's condemnation of all women. Realizing Maureen is "diseased", he quickly pulls out a gun, and "cleanses" the earth of Maureen, just like his good mamma told him. Apparently this event sparks his interest in women, and he starts visiting Goldie's, a local watering hole (which plays Stompin' Tom Connors songs!). He quickly becomes obsessed with a waitress named Mary, and decides to add her to his collection. A few nights later, he slashes her car tires (which he blames on "punk kids"), and offers to drive her into town. Instead, he drives her back to his farmhouse and leaves her waiting on the promise that he is going to get some spare tires. Getting impatient, Mary goes into the house and after lots of atmosphere and spooky music, accidently stumbles on several bodies. She runs out of the house screaming until Ezra catches her. He then ties her up, strips her to her underwear, and locks her in the closet. When she comes to, he invites her to the dinner table, where several corpses have been placed in chairs. This scene is very much like the dinner table in Texas Chainsaw Massacre. Ezra then informs Mary that she will be his new wife, and starts fondling her at the table. She asks him to untie her so she can touch him as well, and he does, only to be knocked in the head with a bottle. Mary attempts to escape again, but is no match for Ezra, who beats her to death with a human leg bone. Jump ahead a few more days and into the Kootz home courtesy of the narrator. In discussing the newspaper stories about the disappearance of the barmaid, Ezra tells Harlon in his loveable stupid way that Mary "ain't missing, she's up at my place." Harlon still laughs off Ezra's proclamations, but a little more warily than before. Harlon's son soon appears and introduces his girlfriend Sally, who works at the local Hardware store. Once again, Ezra is smitten. One day while Harlon and his son are off hunting, he goes in the store to buy some anti-freeze, and he leaves with Sally's body. He puts her in the back of his truck, but she is not dead-- she manages to jump out and run into the forest. Ezra begins to track her down, and this hunter/hunted metaphor becomes stronger when Sally gets her foot caught in an animal trap. Ezra finally takes her body back to his barn, and ties her up by the feet. At this point, Harlon begins to get suspicious and goes after his friend. At this point the film slows down into a freeze frame and the narrator explains how the townspeople burned Ezra's house down. In reality, Ed Gein was arrested and deemed insane. His house was torched much later after residents grew tired of the sensationalism of the case. This low-budget horror film is incredible. Noted Canadian director Bob Clark was a producer, but had his name removed from the film. Tom Savini, who had previously worked with Clark in Deathdream did the great special effects, and went on to work heavily with George Romero in such classics as Dawn of the Dead and Martin. Not only is this a great film, it is a great Canadian film. 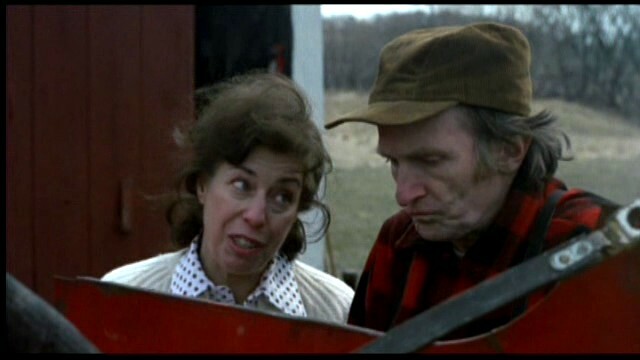 Ed Gein lived in Plainfield, Wisconsin, but the makers of this film chose to shoot this in a small Canadian town. The unflinching camerawork is very similar to that of a film like Goin Down The Road. The scene in the bar gets the Canuck treatment as well, with two Stompin' Tom songs (one I couldn't make out, and "She don't speak English and I don't speak French"). If only Ezra had ordered a Labatt's 50 on tap instead of his whiskey sours. This film is considerably less graphic than Texas Chainsaw Massacre, yet Deranged outdoes it on atmosphere and creepiness. The makers of Henry: Portrait of a Serial Killer could learn something from this. Highly recommended!